Sorry about how pale the colors are and everything... up until now, I've been using the superb scanners at my university, but now that I'm home from college, my so-so standard scanner will have to do. My winks to the 80's continue. Basically, I'm giving Ninten the sort of fandom that I was into back then (although I was 6 in 1988, whereas Ninten is supposed to be 12, so I have to take each medium's target age into account), and Garfield and ALF were just two of the things I remember the 80's for. As for the San Francisco Giants, I've never been much of a sports fans at all, but I'm really milking the Encyclopedia MOTHER for all it's worth to bring out Ninten's personality. I tried a different approach to shading this time: up until now, I did all the shading with my Dark Brown colored pencil, regardless of the value of the color I'd be shading. Since that has proven to be a rather ineffective method, I got several suggestions to shade using a darker value of the color I'm shading. Since I don't have that big of a variety of colored pencils, I instead did all the shading on the computer by using the "darken" tool. Please feel free to give me your responses on this so that I know whether to continue with it or what. I love putting little nuances and inside jokes into my art. Here, on page 3, the bench the two boys are sitting on has an advertisement for Mach Pizza ("We deliver, and that's all!"). Of course, if you want to nitpick, that's a reference to Mother 2, but... hey, Mother is Mother. Also, notice how quick Ke- err, Ninten is to agree to go to Snowman. I bet he's a good little boy who helps old ladies like her across the street. He's really got that "stand-up leadership" thing going for him. kenisu3000 Chapter 1 - Page 28: Holy Flying Furniture, Batman! I might have gone a little too dark on the shading here. It makes it difficult to follow the artwork, and it might take away from my little joke in the middle of the page - it's the whole reason why I included the Garfield poster, was for that sight gag. In fact, it wasn't until I had come up with the idea that I realized how similiar the image was to the same scene in Strawberry Tofu's Crying For MOTHER. Sorry about that, Strawberry - I didn't mean it! Anyway, the Garfield poster was one that I had when I was 13 (one of those "Enter At Your Own Risk" ones with bullet holes in the wall behind Garfield), so I thought I'd bring it back for a little joke. kenisu3000 Chapter 1 - Page 29: NOW, it's Personal! More goodness from the Encyclopedia MOTHER. I'm so out of the loop as far as sports goes that I had to look up Shigeo Nagashima on that Internet Bible known as Wikipedia, just to make sure I got the information correct. One strange thing I found out was that his team is called the Tokyo Giants in the Encyclopedia, but Wikipedia calls them the Yomiuri Giants. It's all Greek to me. 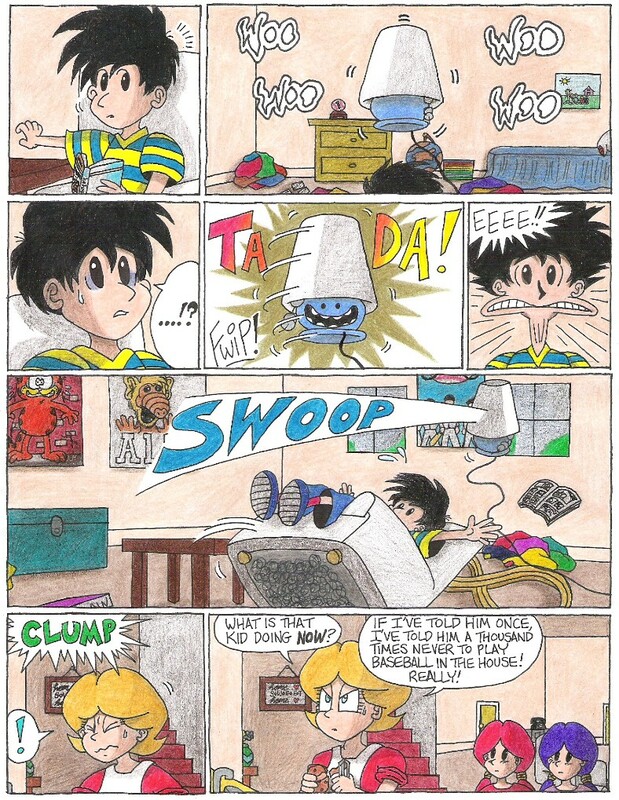 From the very first time I started orchestrating this battle, I knew I wanted Ninten to realize that... "umm.... I'm talking to a lamp....", and then get smacked in the face. Of course, what I was originally going to have him say after that was "Never let your guard down around maniacal electric stands" (because the enemy's Japanese name, Denki Stand, translates out to that), but then I found out that denki can mean "lamp" as well as "electricity". And that last panel... don't ask me where that came from :) I started getting funny ideas, one after the other, and it evolved into one of those dramatic "tumbleweed" scenes. WHERE the wind came from is anyone's guess, but I knew I had to have an article of clothing tumbling across the room for humorous effect. And it landed on tighty-whiteys! Underwear is always funny. So why aren't Ninten and Lloyd all decked out in warm clothing? That's the beauty of cartoons - it doesn't have to make sense. Page 12 has to be my absolute favorite :) It's all about the disgusting sneezing. Of course, I was pulling a wink at the game again, where you have to be careful who you talk to in Snowman, or they just might cough all over you and give you a cold. So originally I was going to make it a cough, but I decided sneezing would be infinitely funnier.